“It’s Mine!! It’s Mine!! Mommy! !” How many of you have heard this from your children? And when you lift your eyes to see the problem you find a tug of war ensuing between your puppy and child over a toy. Usually your child’s favorite toy. Can you really teach your puppy to leave your children’s toys alone without having to have them locked away all the time? Can you really teach a puppy to be able to discern which toys are his? The answer is yes. First you will need a toy box for the dog toys. I use a green recycle basket. Works great and is not too high or deep. Next you will need a scent. Something like vanilla, maple or almond. Any scent will do. I prefer almond just because it is not a smell you would find on toys or objects, plus it is clear. I use almond extract. Take the extract and put a small drop on each of the dogs toys. If it is a plastic toy then put on the scent and leave it to dry for about 15-20 minutes. Then put it in the basket. You will need to replace the scent every four or five days. The rest is just patience and persistence. 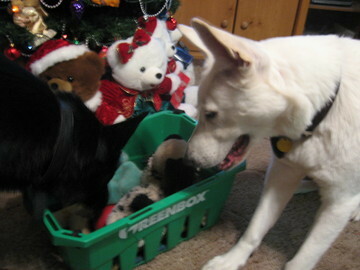 Start out with bringing the puppy to his toy box. Make sure it is always in the main room the dog is in and easily assessable. Take each toy out one at a time and play with him with it. Praising him all the time. Then place the toy in the toy box and take out the next one as he watches. Keep doing this till you have introduced him to all his toys. This is teaching him where his toys are and that these toys are allowed to be played with. The scent marker on the toys is to help him to discern his toys from everything else. After this every time you find him with a toy that is not his clap your hands loudly to distract him from the toy, take it from him and very firmly say “(puppy’s name)Not Yours.” Then immediately take him to his toy box and introduce him to his toys. Play with him with one of his toys and praise. Follow this routine every single time he is caught with a toy that is not his. In a few months your puppy will know the difference between his toys and your children’s toys. Usually by the time they are 10 months to a year you can stop scenting the toys. But every time you introduce a new toy add the scent for a couple of weeks so the dog knows it is his to play with. Soon you will be able to trust you dog as much as you can see I trust mine.